Professor John Oates, who taught anthropology at Hunter for nearly 30 years, has been named the winner of one of the most prestigious awards in his field, the International Primatological Society's Lifetime Achievement Award, which is given to only one senior scholar in primatology every two years. The award, said the Society's announcement, is given "to a member of the IPS for outstanding career contributions to research, conservation, education, and/or captive care and breeding of nonhuman primates, with attention to efforts with enduring international scope." A leader in African primate conservation throughout his career, Dr. Oates is an internationally respected authority on primatology, the ecology of tropical forests, wildlife surveys, the design of national parks, and priorities for conserving threatened species. "A good deal of my research since joining Hunter has been in West Africa, studying the ecology of rain-forest primates and getting increasingly involved in conservation," he said. "I put some of the knowledge I acquired over those years into Primates of West Africa, a book published by Conservation International last year." 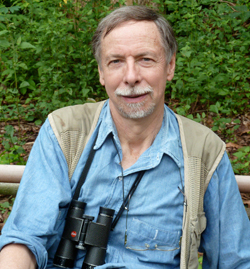 Oates has conducted field research in Cote d'Ivoire, Ghana, Equatorial Guinea, India, Liberia, Nigeria, Sierra Leone, and Uganda; received 26 grants from such organizations as the National Geographic Society, the National Science Foundation, the U.S. Wildlife Fund, and the Wildlife Conservation Society; and written several influential books including Colobine Monkeys: Their Ecology, Behaviour and Evolution (Cambridge University Press), Myth and Reality in the Rain Forest: How Conservation Strategies are Failing in West Africa (University of California Press), and the recent Primates of West Africa: A Field Guide and Natural History. He has also written 18 book chapters, 50 articles in professional journals, and a host of other publications including book reviews and reports to governments and conservation agencies. Now a Hunter professor emeritus of anthropology, Oates was on the Hunter faculty as well as the doctoral faculty of the CUNY Graduate Center from 1978-2008 and has taught at Rockefeller University, the University of Benin in Nigeria, and the University of Sierra Leone. "I am very honored to receive the IPS award," Oates said, "but I am also acutely aware of how many distinguished colleagues have also devoted lifetimes of work to primatology and are just as deserving of such recognition." Said Marc Edelman, chair of Hunter's Anthropology Department, upon learning of Professor Oates's award: "In his distinguished career as a primatologist, John Oates pioneered the study of endangered species and threatened habitats in Africa. In an era when policy-makers frequently seek to link conservation and market-oriented development, Oates has been an important critical voice questioning the prevailing wisdom. His book Mythmaking and Reality in the Rain Forest is a widely cited landmark study on the problems of sustainability, forest and biodiversity protection, and resource governance." The award will be officially presented to Professor Oates at the Congress of the International Primatological Society to be held this August in Cancun, Mexico. And this weekend he is leaving for Cameroon to participate in a workshop to formulate a new action plan for the conservation of Cross River gorillas.